Pens, paper & paints for the Reef! This year has started with me ‘drawing out’ the final stages of my kids picture book about our Great Barrier Reef! I have spent almost everyday this year in my art studio finalising the illustrations for my first picture book, which has been both a challenging and incredible experience as I have never undertaken such a complex, time-consuming and brain-draining activity in all of my life (…and I have a 7-year old Great Dane!). Writing and illustrating a kids picture book is no walk in the park, or in my case, no quick dip in the ocean. I am loving the experience though and sea-ing what I can achieve with my pens, paper and paints for the Reef! All this creativity is done from my little art studio, which happens to be our laundry so is only a small space (1.5m x 1.8m) for a 6-foot tall creative such as myself. But I get a few visits from my creative companions as I create, and as you can see Mr Fergus doesn’t mind the view from the art studio! 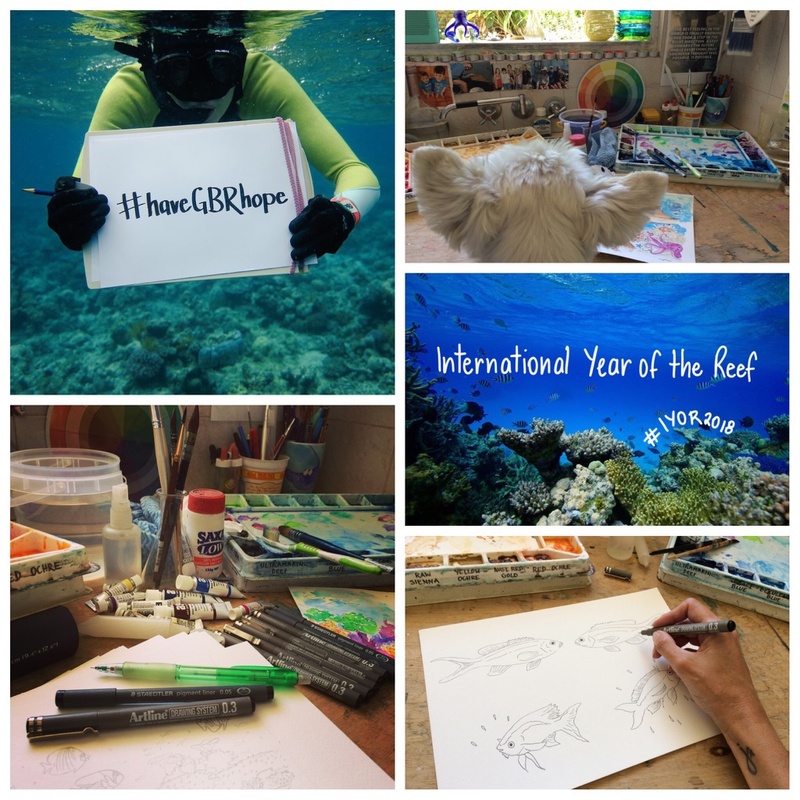 My picture book by Dr Suzie Starfish uses the art of marine science to illustrate the challenges facing our Great Barrier Reef during this the International Year of the Reef #IYOR2018. The story is told through the eyes of a feisty fish named Anthia, which you can ‘sea’ being outlined in the photos. Anthia takes us through her beautiful and colourful underwater home on the Great Barrier Reef and through her eyes we ‘sea’ what happens to the Reef when we are not looking! Along with the colourful underwater gardens there are many other underwater wonders to meet on the Reef, colourful characters I will soon share with you. This story is also about solutions and messages of hope and encourages kids and readers to always have a BIG splash of ocean optimism. I will be sharing the progress of my story here over the next few months and you can ‘sea’ more detail over at the The Great Barrier Reef and by following the books hashtag #haveGBRhope. You can dive in and follow my creative journey and ocean storytelling as Dr Suzie Starfish on Facebook and @suepillans on Twitter and Instagram. Please don’t hesitate to contact me if you are interested in engaging me in school visits or science-art and storytelling activities.